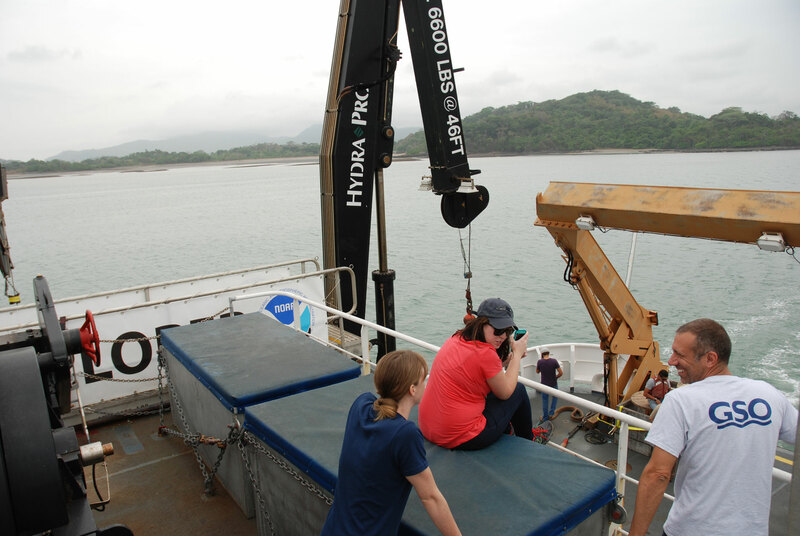 FIGURE 1: Explorers in Training Abigail Casavant (middle) and Mike Barber (right) are given a ship orientation by Expedition Coordinator Lindsay McKenna (left) as NOAA Ship Okeanos Explorer left the Panama Canal. Image courtesy of NOAA Office of Ocean Exploration and Research. Download larger version (jpg, 354 KB). 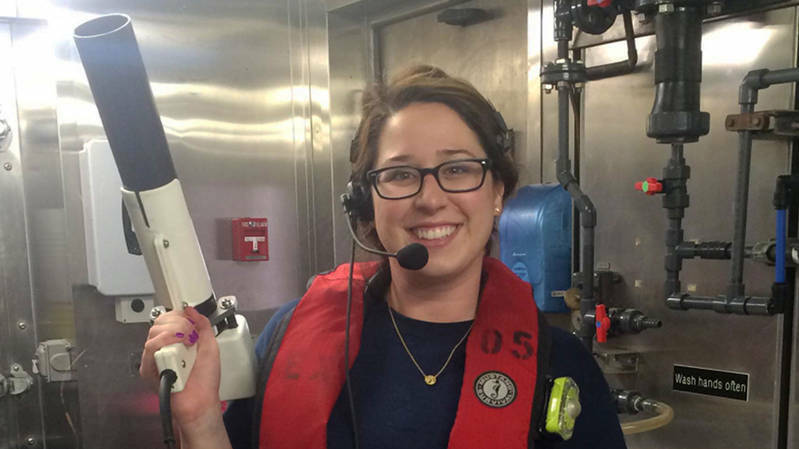 When I received the notification that I would be one of NOAA’s Explorers-In-Training aboard NOAA Ship Okeanos Explorer, I was excited to join my first expedition out to sea. While I have been on a boat numerous times conducting archaeological fieldwork, I had never lived onboard a research vessel for an extended period of time. This opportunity was the perfect fit for my research interests. I graduated in December 2014 from the University of Rhode Island with a graduate certificate in GIS and remote sensing and will be completing my M.A. in history and underwater archaeology there this fall. It was during this time that I became especially interested in deep-water archaeological sites. Underwater archaeology is still a relatively new field in terms of age and technological advances. With the advent of scuba technology, the ocean environment became more accessible to scientists, archaeologists, and recreational divers alike. While scuba allows researchers to reach shipwreck sites in shallower waters, it restricts the study of any wrecks at very deep depths. A common misconception is that most shipwrecks are found along shallow coastlines and that mariners favored these routes over the vast open seas. Despite the risks of crossing open oceans and seas, many vessels chose this course. Sonar systems such as multibeams, subbottom profilers, and single beams can be used to detect and study these deep-water wrecks. FIGURE 1: Preparing for an XBT cast. On NOAA Ship Okeanos Explorer we need to conduct an XBT every 4-6 hours to ensure we have accurate information about the sound velocity in the area we are mapping. Image courtesy of NOAA Office of Ocean Exploration and Research, Tropical Exploration 2015. Download larger version (jpg, 530 KB). I am gaining skills applicable to my field that I could have never learned in a classroom or lab. As a member of the science team, I have learned about and used all of these systems on Okeanos. I stand an eight-hour mapping watch to learn multibeam data acquisition and processing from an experienced watch lead. James Miller, a physical scientist from NOAA’s Atlantic Hydrographic Branch, is the watch lead for our 7:30 pm to 3:30 am mapping shift. Despite the seemingly grueling hours of a long overnight watch, James and I utilize this time by discussing different types of sonars and the way these systems can be applied to a variety of fields. James has also taught me how to process multibeam, backscatter, and water column data in a variety of software suites including CARIS and Fledermaus. About every six hours, we launch expendable bathythermographs (XBT) to collect sound velocity profile data to support the bathymetric data being collected. 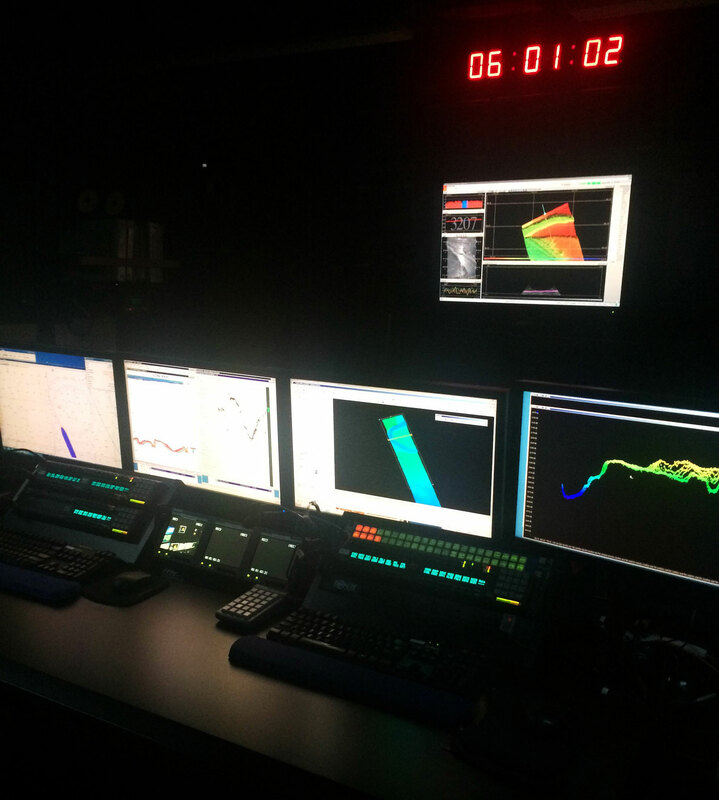 FIGURE 1: On the screens of the control room from left to right: digital nautical charts that show our relative position; data acquisition screens from the EK60 and sub-bottom profiler sonars; multibeam data processing in CARIS. At the top of the image is the UTC time and the data acquisition screen from the EM302 multibeam sonar. You can also see the RTS intercom units that we use to communicate throughout the ship and with shore underneath the computer screens. Image courtesy of NOAA Office of Ocean Exploration and Research, Tropical Exploration 2015. Download larger version (jpg, 331 KB). It is especially critical for maritime archaeologists to understand how intrinsic biology, geology, and other fields are to site formation and processes, especially in deep water. Exploring the different branches of ocean sciences aids maritime archaeologists in better understanding the environment in which we work. 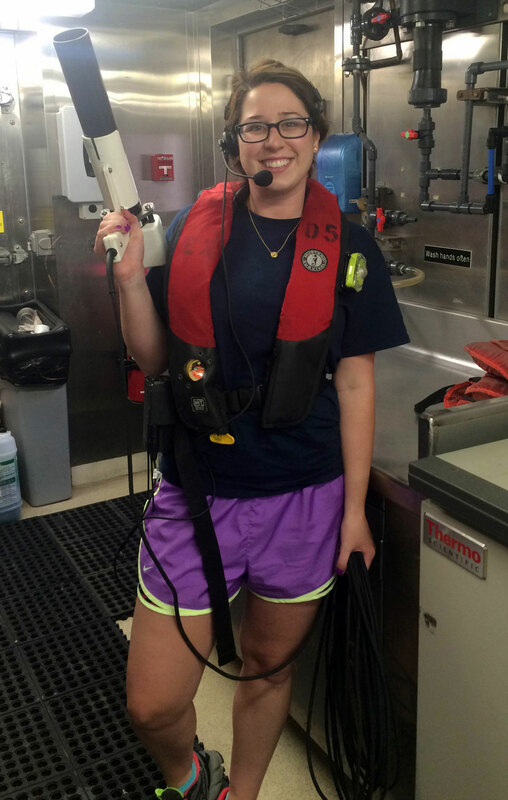 Aboard Okeanos, I am learning from scientists and crew members about the ocean floor, ship operations, and exploration. The future of ocean exploration and underwater archaeology lies within the deep ocean, allowing scientists to go beyond the shallows and into unknown territory. It is this unknown territory that will be the greatest frontier not only for archaeology but also for biology, engineering, geology, and other fields that study the ocean. Okeanos is leading the way for ocean exploration and helping all scientists piece together the ocean’s mysteries.